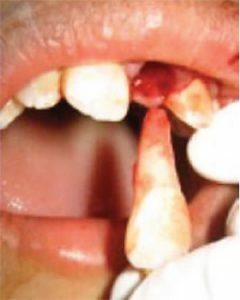 If you can find the fragment of tooth you will want to keep it and call a dentist right away. Depending on the size of the fragment it can often be bonded back on. If you can see blood coming from the center of the tooth you will likely need a root canal or possibly an extraction. Early treatment is the best way to keep the tooth from turning dark. This may require an extraction and placement of a dental implant. 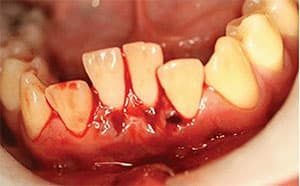 Many times when front teeth must be extracted the implant should be placed immediately to preserve the boney architecture and gingival contours. This usually doesn’t require treatment. 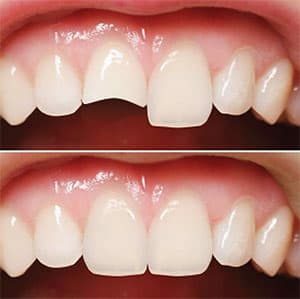 Give the tooth a couple weeks to see if it tightens up. Stick to soft foods for 1-2 weeks. Chances are this will be just fine. If it begins to ache you should schedule an appointment to see a dentist. Call a dentist ASAP. The teeth need to be put back into position and splinted. There is a good chance these teeth will need a root canal, but it usually takes a few weeks to know for sure. Repositioning the teeth is very time sensitive. This may sound gross but clean the tooth with your own saliva(not tap water or any other liquids). Put the tooth back into the socket yourself and call a dentist immediately. The success rates of replanting a tooth drop drastically the longer it is out of your mouth. If replanted in the first hour this can be very successful. 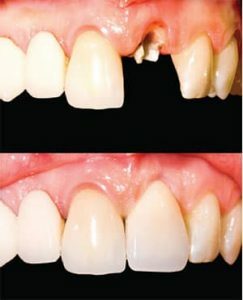 You still need to see a dentist ASAP in order to splint the tooth. Call my cell if you need help walking through this process. If you are having a toothache or dental trauma you are always welcome to call me 7 days a week, day or night. I live close by the office and its never a big deal to come in during the evening or weekend. Ride safe out there and remember to wear a helmet!